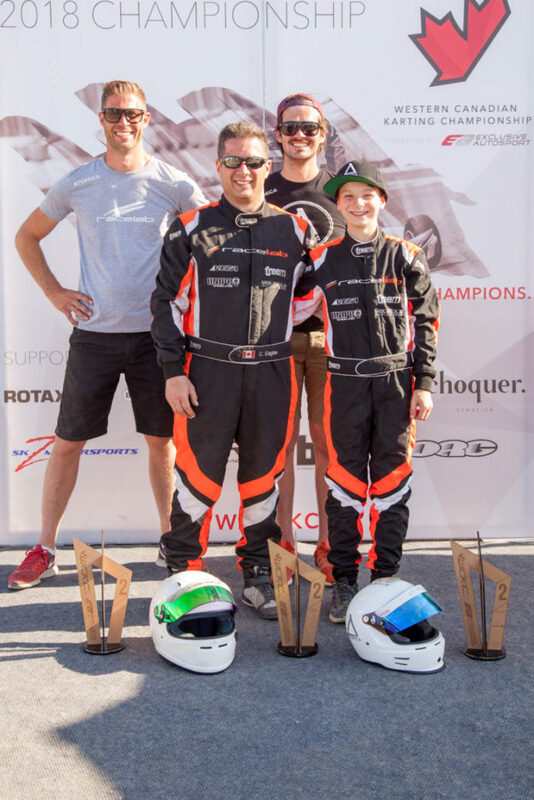 As the newly formed Western Canadian Karting Championships is poised to become Canada’s premier Rotax powered karting series it is also rolling along as one of the nation’s largest and most competitive series. The first round recently held in Strathmore, Alberta was everything the WCKC was set out to be and thats a big competition event with a more regional feel creating a great atmosphere for everyone involved. The Atomica Chassis had several drivers including the largest contingent of Mini Max racers in the field. The crew was up against the current micro max champion Diego Laroque who through some intense testing and lights out driving managed to set a pace that was untouchable by any of the other drivers in the field. The gap closed however with a few drivers closing in on the American by the final day. He however managed to take both finals by a solid margin leaving the remaining drivers to battle for 2nd and battle they did. Atomica’s Antonio Costantino was in the hunt for the top spot in those battles both days but on Saturday just fell short of the podium with a 4th but on Sunday he redeemed himself completely as he made gutsy pass for 2nd overall and made it stick all the way to the checkered flag making his way to the podium. Costantino will sit one point out of second overall leaving Alberta. Ian Qiu also had a great showing as the Vancouver resident is in only his 1st year of racing however found himself in fifth position several times over the weekend showing promise for the near future. In The Shifter Open Racelab’s Ironman Chris Eagles in only his first season in gearbox racing managed to put in some top performances and the Atomica SLS 125 chassis did a great job with reacting to the conditions with the Modena engine propelling Eagles to 2nd on both days against a stacked hometown field of veteran racers. Eagles wasn’t done there as he put his Rotax powered SLS on the podium on Saturday with a 2nd place finish in the large Masters class. On Sunday he was forced to settle for 4th despite being one of the 2 fastest karts on the track. “We’re going into the next round in Saskatoon really happy with how things are progressing with our drivers, we’ve taken on a lot of new challenges this year with new classes and drivers and everyone is responding well as is the equipment that has been performing exceptionally all year” stated team principle Steve Rickman following the event. The Racelab team will make their way to the second round in a months time in Martensville, Saskatchewan with their eyes on the podium and in search of advancing to the Rotax Max World Finals in Brazil.